A poor performance by the Steeldogs in the first leg left them with far too much to do in the second game. The Dogs got off to a slow start in Telford and went behind to a deflected shot. Cam Brownley had a chance to level short handed but couldn't get the shot away and the Tigers made it 2-0 with seven seconds left in the first period. Fans hoping the team would emerge for the rest of the game playing like league winners were to be disappointed; three more goals were conceded with a limited resistance and that Telford only added one more in the final period was more of the hosts resting their best players. The team looked disappointed after the game and there was a suggestion that some of the team may have been taking it easy since the end of league season. At 6-0 down, a comeback was very unlikely but the chance for the team to redeem themselves was there to be taken - and the Dogs showed the effort and ability that had seen them finish top of the pile. Brownley sniped an opener in the 13th minute and when Ashley Calvert scored his second goal, Telford looked worried. However a long stoppage to fix the boards killed the momentum and although Sheffield kept pushing the opportunity had past. A 3-2 win on the night but more importantly, a return to the play that has been the norm this year – and the Steeldogs will need more of that over the next week. On Saturday they play Basingstoke in the semi-finals of the Final Four in Coventry. The winner will play Telford or Peterborough on Sunday to become National Playoff Champions. The finale to the Steeldogs season will be the National Cup Final. 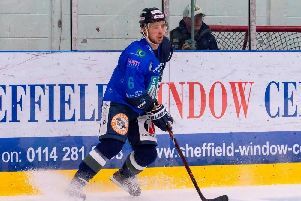 They take on the Swindon Wildcats at iceSheffield next Wednesday. The game faces off at 7:30 as the Steeldogs go for their second (or maybe third) trophy of the season.